Three Bird Summer by Sara St. Antoine. Review: The idea of a neighbor girl filled me with dread, Adam said in the car driving to his grandma's cabin. The book, Three Bird Summer, written by Sara St. Antoine, contains many outstanding adventures. The main character, Adam, finds notes in his Grandma's cabin saying there is a hidden treasure, and he needs the new neighbor, Alice, to help him. Will Alice try to find it with him? Will they spy the treasure? Read Three Bird Summer to find out!! For as long as he could remember, Adam went to his grandma's cabin in the summer with his crazy cousins who always pulled pranks on him, his Mom, and Dad. This year, only his mom and he were going because in the winter his parents got divorced. He soon found out that a new neighbor moved in next door to Grandma's, and her name was Alice. He thought she was going to be just like the popular girls at school, but it turned out that she was different than them and wanted to be friends with him. Soon, he started finding notes in his room saying there was a treasure nearby. He needed Alice to help him find it. Many exciting adventures followed, and if you want to know what happened, read the book to find out!! I think the book Three Bird Summer is really great. It always left me thinking, and I could NOT set it down. I just wish the book were longer because it was incredible. I would love it if there were another book, maybe even a whole series!! I think both boys and girls would like it because it's about camping and going on interesting expeditions. It is very adventurous. I think it is for grades 4-8 because even though it is 246 pages; the vocabulary words aren't too difficult or too easy. If you love camping and going exploring, I would really recommend reading this book. We would like to thank Candlewick Press for providing a copy of Three Bird Summer for this review. 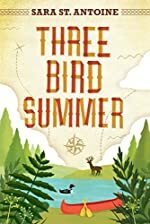 Have you read Three Bird Summer? How would you rate it?